Help! How do I make my kitchen look bigger? This is one of the most common questions we hear from customers planning a kitchen remodel. While small kitchens can be designed to be functional, they still don’t always feel or look very big. You don’t want to feel cramped when you invite guests over, but in order to actually expand the square footage of your kitchen you will need to knock down walls—a rather costly venture. Humans are smart but can still be tricked, there are a number of tricks you can apply to your kitchen design in order to make it actually appear larger. Allow us to explain 7 tricks proven to expand the size of your kitchen. The best part? These tricks are accessible no matter your budget! 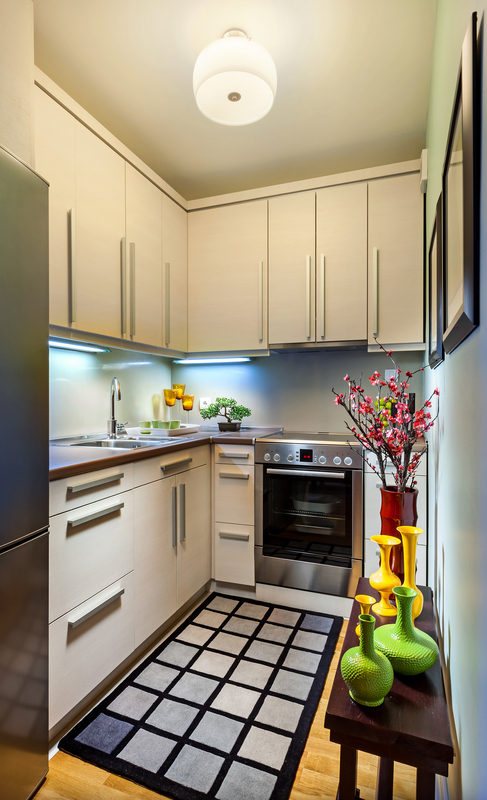 You don’t need to stick to only one color when designing your kitchen, but it helps expand the size of your space when you use colors that have a low-contrast. In order to tell if colors are low or high contrast, you must take it back to Pre-kindergarten and look at a color pinwheel. The colors on this wheel that are closest together are considered low-contrast, or similar in undertone. Colors on the wheel that are on opposite ends signal a high color contrast. Black and white are considered the highest-contrast possible, although yellow and blue, and green and purple, are all considered high color contrast combinations as well. The darkest shade of blue and the lightest shade of blue are also considered a high contrast. On the other hand, a medium and dark-medium shade of green are low-contrast. By carefully selecting the colors using this system, you can incorporate similar tones that actually make your kitchen look larger. But why is this true? When cabinets, counters, backsplashes, and accents all have a similar underlying tone the eye is able to easily move from place to place without getting caught up on one detail. Your eye looks for color contrast as a place to rest, but when your eye can continually roam around from detail to detail, a space suddenly appears larger. This is probably the most common way people use to make their kitchens appear bigger. Dark colored walls are always going to make a space appear smaller and more condensed, compared with the more open and airy feeling white walls provide. White cabinets have been the go-to color for a while now. They provide a clean and sleek appearance that actually makes a kitchen appear larger. Just like the white walls, white kitchen cabinets take up a good amount of space and therefore make the same statement. You can change out the cabinet faces on a few of your cabinets for glass in order to provide an open-face appeal. You might not want to make all of your cabinet doors glass, otherwise you risk over-kill. But 3 or 4 cabinets evenly sprinkled throughout looks nice and opens up a smaller kitchen. Glass cabinets are just another way to trick the eye into thinking a space is bigger than it really is. With glass, the eye can see past the cabinet door, deep inside of the space, so that suddenly there is more to look at and the space feels larger. If you know that your cabinets often become a cluttered mess, this might not be the best way to make your kitchen feel larger. When glass cabinets become cluttered they loss some of their expansion powers and can instead start to make your space feel cramped and over-filled. Natural light makes every space look and feel bigger, as it brings the outdoors in. If there are any windows in your kitchen, aim to install window coverings that allow easy access to the light. If your kitchen has no window, look into installing one in order to bring some light into the kitchen. Nothing cramps a room like oversized furniture. When you have a lot of square footage to use up, big furniture works, but when you are trying to make a space look smaller, you want petite furniture. That doesn’t mean you have to skip out on a table big enough for your family to comfortably sit around, instead look for thinner chair legs or table slabs, this alone will help make a space appear bigger. Stay away from thick, bulky furniture, which shows off its size in exchange for making the surrounding space appear smaller. If you are having a ‘fat day’ you don’t want to put on your tight horizontal strip shirt, after all horizontal lines are known to enlarge everything they adorn. The same is true for your kitchen, by adding a horizontal stripped floor, carpet or backsplash you can make your kitchen appear wider than it is. Tops Kitchen Cabinet offers wholesale cabinets, counters and more! We can help make your kitchen look larger for a fraction of the cost.